Albert Einstein 14 March 1879 18 April 1955 American, German, Swiss Hermann Einstein Pauline Einstein Author, Mathematician, Philosopher, Theoretical Physicist, Teacher Einstein treated matter and energy as exchangeable. The theory of relativity, which laid the basis for the release of atomic energy. In 1905 Albert Einstein formulates Special Theory of Relativity. 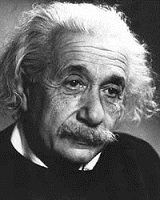 A list of popular albert einstein quotes are given below.